While I'm not a professional recording artist (as you can tell by the submitted recording) I an a huge hockey fan and have played, refereed, watched and continue to play hockey to this day. Hockey is a part of me, like so many other Canadians out there. The background behind "Hockey Days" is this. First I thought about HNIC. The song needs to be catchy and it should be a rock song. Hockey is a fast sport and the theme should reflect that. Hence the riff that I created.... simple and fast. For those that have grown up in Canada and played or been apart of the game, I'm sure you can relate. To waking up at six, grabbing your hockey gear and driving to the cold arena to practice. The first time you join a hockey team, you dream about scoring a key goal, or making a key defensive play or making a key save to help your team win greatest trophy in all of sports, the Stanley Cup. Hockey Days represents hockey moms and hockey days sacrificing their time and money so that their children can play the game and make it to the NHL. Hockey Days represents the players in junior who were told that they weren't big enough or couldn't skate fast enough to play the game. Hockey Days represents going through the ranks and playing Junior until draft day and getting selected in the NHL Entry draft, signing a pro contract, entering the dressing room for the first time. Hockey Days represents the coaches, the referees, the fans, the owners, the players, the players' families and all of the people who get excited about playing hockey. Hockey Days represent the rookies on the team who deep down are scared of playing that first shift. The song represents the role players who are not always part of the limelight, the Black Aces who ride the bench and are up in the press box more nights than not. Hockey Days represents the grizzled old veteran who plays in the NHL in 20 years only going to the Stanley Cup Finals once in their career and fails to win the prize. 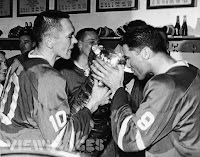 Forget about signing the big professional contract, "Hockey Days" is about the dream of playing the great game of hockey and being able to taste a sip of champagne out of the Stanley Cup. we're on our way to the rink. so we can take a sip from the drink. that gives us a sip from the drink.... that gives us a sip from the drink.... that gives us a sip from the drink.